Looking at the DeWalt DWP611PK, you can tell that DeWalt is bringing its compact routers to a whole new level. This kit comes with a fixed and plunge base, giving you the advantage of versatility. This combo kit combines variety and power which makes it the perfect tool to buy as a professional or DIY woodworker. The high performance of this combo kit actually makes it perfect for both beginners, intermediates and experts in the woodworking industry. The fixed and the plunge base also comes with innovative designs and ergonomic features that improve the overall performance of the router making it preferable to other combo kits. This kit actually comes with a very affordable price tag. Dewalt is an American company that has been in the making of power tools for over 95 years now and I don’t think they would back down now. With over 200 types of power tool have been manufactured, and 800 accessories made, the company has been building its reputation for a very long time. Most people highly recommend their power tools, claiming it is the best there is and when it comes to the DeWalt DWP611PK it doesn’t back down. Now before we look fully at the specifications, let us take a very quick review on the pros and cons of this combo kit. When purchasing a router, the very first thing a woodworker would check is the horsepower rating of its motor in the given router. And when it comes to the DeWalt DWP611PK, it comes with the only 1.25HP making it one of the smallest routers in the market. Well, don’t let its small size fool you, this comes with much torque and power, making it the best option for small woodworking jobs in the shop or around your house. The router also integrates the soft start technology, which helps to decrease the torque on the motor during startup. This also helps to decrease the stress on the motor. This router is also equipped with a variable speed setting which goes from 1 to 6 and a maximum range of 16,000 RPM to 27,000 RPM. This can be regulated by turning the variable speed dial, to choose the maximum range, speed suitable for your woodwork project at hand. Also, the electronic speed control maintains speed under load to prevent burning. When you set your variable speed dial from 1 to 3, you can have a maximum RPM of about 16,000 to 20,400 which can be used for larger bits and cutters. When you set the dial from 4 to 6, you can also get a maximum speed of 22,600 to 27,000 which is best suitable for smaller bits and cutters. This gives you a wide range of options to cut different materials like wood and plastics too, making it perfect for both DIY contractors and professionals in construction sites. With this kit, you are entitled to the fixed and the plunge base options. The DeWalt DWP611PK’s router is easy to move back and front between the two bases. So you just have to lock it down and you are ready to go. The fixed base can be used for trimming and edging, while the plunger base is capable enough to handle up to 90% of the jobs done in the workshop or around the house. Q: Can you make circles with this combo kit? A: Yes, you can, but with a circle cutting jig. You need to buy it separately from the combo kit. Q: Which type of router table, can you use this router on? A: This router can be used on a Rockler Trim Router Table, or any other recommended router table. It is better to make researches first. Q: Does this device come with a warranty? A: Yes, it does, currently a three-year warranty. It also comes with a ninety-day trial in which your money can be refundable within three months and also a year of free servicing. Researching about this combo kit, we found out that the reviews from the general public really say much about this package. It was highly rated and the users really enjoyed getting this combo kit. While some users say this is the best combo kit ever, some others say they replaced their Bosch combo kit for this combo kit ad they really got the best result from it. Others claimed it performed well and another user built a whole guitar with the router. Well, others were not impressed with this product, some said the parts melt if you use it for a long period of time. Some claimed the router immediately stopped after a few hours of usage. But overall, looking at the ratings, you can actually find out that this combo kit satisfied way more users that it ever faulted. It is really a great combo kit to look into for smaller projects. Looking at the reviews and the general impressions, there is no doubt that this combo kit is perfect for smaller projects. Although it recommended for that, it still gives you that professional finish in a small scalar quantity. 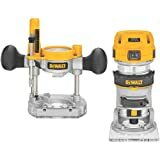 This is a great combo to get if you are into DIY most especially, so when you are considering to get a router kit for your workshop, the DeWalt DWP611PK should be the first thing that comes to your mind.